U.S. stocks surged last Friday as strong July jobs data, the second consecutive payrolls report that widely exceeded economists’ forecasts, eased concerns that economic growth is slowing. Employers added 255,000 jobs last month, surpassing projections for 180,000, while revisions for the prior two months added a further 18,000 jobs. Separate data showed the unemployment rate held steady at 4.9% as the nation’s work force rate crept higher to 62.8%. Also positive, wages increased 0.3%, the most since April. For the week, the S&P 500 rose +0.49%, the Dow Industrials gained +0.60%, and MSCI EAFE (developed international) fell -1.35%. As the above chart from S&P Dow Jones illustrates, the percentage of products and services produced or sold by S&P 500 companies outside the U.S. equated to 44.3% in 2015, down from 47.8% in 2014 and the 46% average from 2009-2013. In 2006, it was 43.6%. 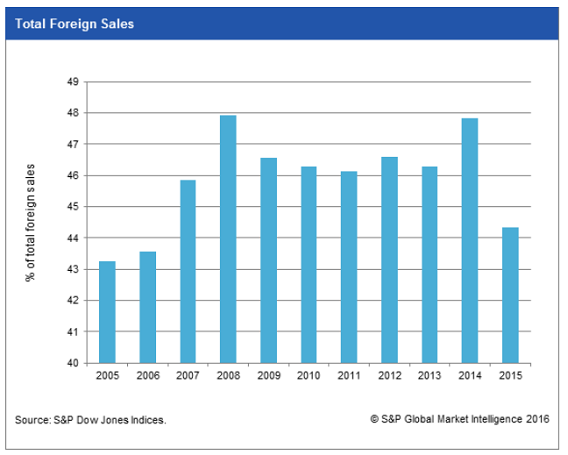 From a geographical standpoint, European sales continued to increase in 2015, with Europe emerging as the dominant region and accounting for 7.79% of all S&P 500 sales, up from 7.46% in 2014 and 6.80% in 2013. After declining four years in a row, U.K. sales increased to 1.86% from 0.89% in 2014. Asian sales decreased, representing 6.77% of S&P 500 sales, down from 7.80% in 2014 and 7.71% in 2013. Canadian sales decreased to 1.17% from 3.51% in 2014 partially because of oil and commodity price declines and less demand for the industry's related services and equipment. African sales also decreased to 3.16% from 4.09% in 2014 and 3.55% in 2013. Lastly, something for the U.S. presidential candidates to ponder: In 2015, S&P 500 companies continued paying more for income taxes in the U.S. than overseas. Approximately two-thirds of tax payments went to the U.S., up from 61.8% in 2014 and 54.9% in 2013. Meanwhile, 33.2% of taxes were sent to foreign governments in 2015, down from 38.2% in 2014 and 45.1% in 2013. Actual payments to Washington decreased 0.4% in 2015 to $184.4 billion, down from $185.2 billion in 2014.